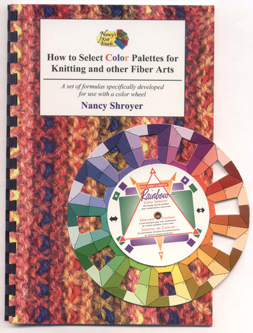 It includes the best color wheel made for fiber, a 5" Color Wheel made by K1C2 and it has 24 pages. 5.5" x 8.5" (with a plastic comb binding so you can keep the book open) in black & white text with a laminated color cover. how to apply the color wheel to your fiber arts projects. We have sold thousands since it was first published.